Blick Mega Brushes are perfect for big projects. 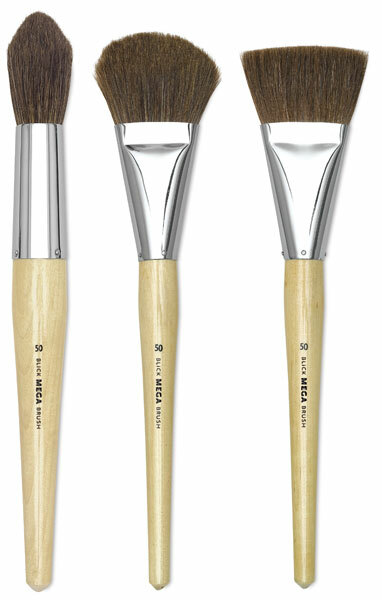 These brushes are made of 100% pure, soft pony hair – a durable hair ideal for applying thicker, heavier color on flat or textured watercolor surfaces. High-quality brush hairs are set in nickel-plated brass ferrules, assuring smooth performance, reliability, and longevity. All are securely bonded to short, lacquered hardwood handles with glue and stainless steel nails. 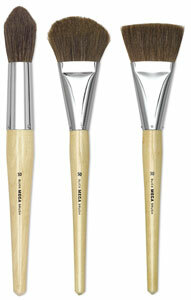 Mega Pony Hair, Set of 9 — This Mega Pony Hair set contains 9 brushes: three Round 30, three Flat 50, and three Filbert 40.